3D machining; surfacte treatment; laser cutting and welding. The equipment is a 5 kW high-frequency excited CO2 gas laser, with 5 axis CNC beam guiding system, which allows 3D processing (cutting, welding). The device is 2,7 kW Nd:YAG solid laser with optical fibre beam guiding, with a 7-axis robot, and an external rotating axis for moving the parts to be processed. A scanner head can be used for surface treatment technologies (surface layer modification, surface quenching, powder weld surfacing). 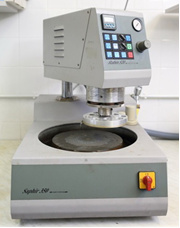 We are able to cut samples with our water-cooler, diamond disc cutters above 60 HRC hardness. Depending on the number of the samples, it is possible to apply mechanical or manual embedding. 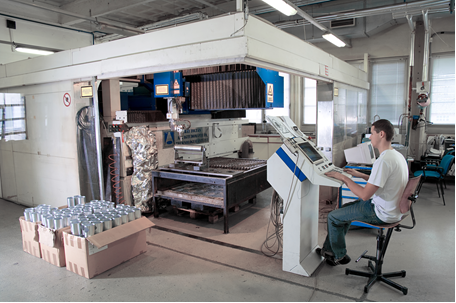 Polishing samples can happen manually, or – in case of large numbers – with an automatic grinding and polishing equipment. We are able to take microscopic pictures with our Keyence digital light-microscope, which can make 3-dimensional microscopic pictures also. 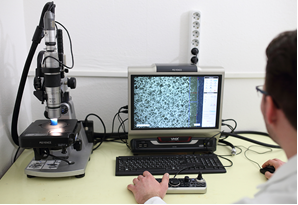 With our Leica Micro Vickers hardness testing device, the hardness of the phases of the samples can also be measured. A hardness map can be created with the ultrasonic hardness tester, which is moved with a high-precision stepping motor. 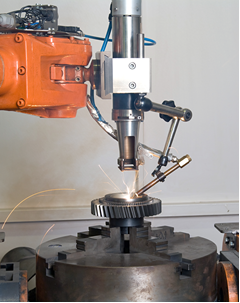 key-hole laser welding and cutting of automotive components. Address: H-1116 Budapest, Kondorfa utca 1.